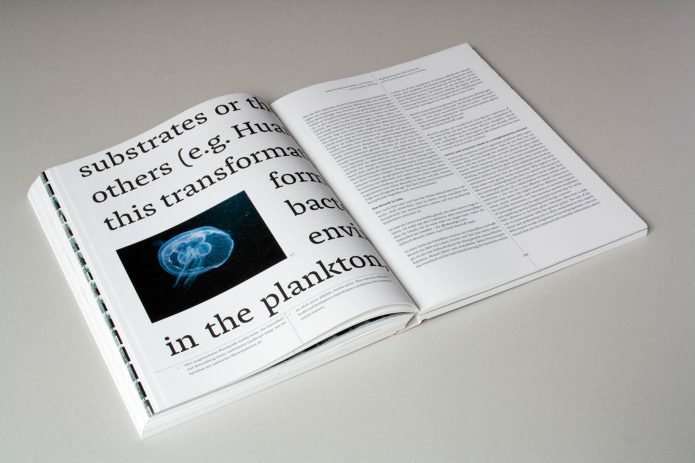 Book release "A Collaboration Between Art, Design & Science"
The book reviews the art university’s attempts towards formulating artistic research methods and reflective practices after ten years of collaboration with the cluster of excellece “The Future Ocean”. As an expert on the subject, I have been asked to edit the book by academic standards and to jointly develop the concept for the publication. I supported the institutional editors from the fields of arts and design, who had no prior academic publishing experience. Additionally, I worked with each of the authors from different disciplines on the content of their articles and brought in my network of translators. with contributions from Johanna Barnbeck, Thomas G. Bosch, Tom Duscher, Christian Engler, Ingrid Ernst, Rainer W. Ernst, Tobias Hoss, Julian Klein, Stephan Sachs, Norbert M. Schmitz, Manfred Schulz, Peter Friedrich Stephan, Martin Visbeck, Klaus Wallmann & Arne Zerbst. My work has been in close coordination with Jolan Kieschke, in charge of production, and the graphic designers Theresa Döge and Björn Schmidt, who transferred the multimedia projects into new concepts for print. Due to their meticulous design, the book has been shortlisted by Stiftung Buchkunst for the “Die schönsten deutschen Bücher 2017”-Award (An award for the most beautiful books). More info on my work with “The Future Ocean” Cluster of Excellence and the Muthesius University of Fine Arts & Design can be found here.